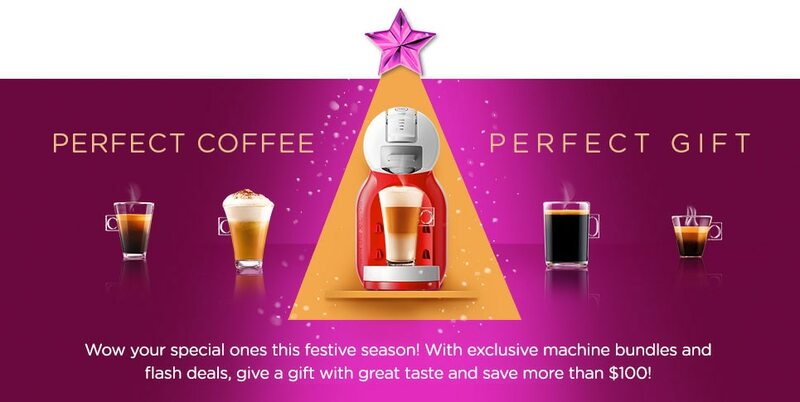 NESCAFÉ® Dolce Gusto® coffee experience with our special recipes. 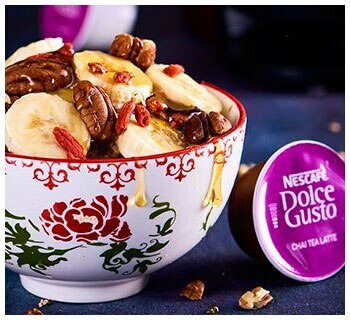 WITH GREEK YOGHURT Experience a unique dessert that blends the intensity of Grande Intenso with the sweetness of fig. Combine all ingredients in medium sized saucepan. Boil, reduce heat and simmer for 15 minutes. Allow to cool to room temperature. Cover and refrigerate. Spoon 100g of Greek yoghurt into four glasses. Top with coffee fig compote and crushed walnuts. 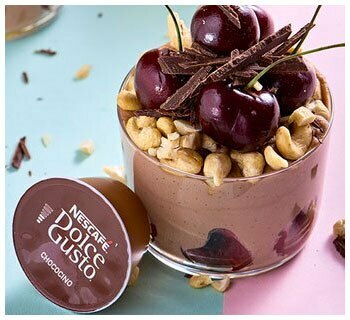 CHERRY CHOCOCINO CASHEW PARFAIT Sweet tart cherries layered between chocolate ashew cream and dark chocolate shavings, makes for an indulgent treat that can be enjoyed anytime. Drain cashews and add to food processor. Process for a few minutes. Add the Chococino agave syrup and vanilla bean paste to the food processor. Layer the Chococino cream, fresh cherries, dark chocolate shavings and coconut in small bowls or mason jars. CHAI SPICED PORRIDGE Wake up to a bowl of warm, creamy porridge that smells of delicious spices. Mash banana in a small saucepan. Add remaining ingredients into the saucepan and simmer for 10 minutes. 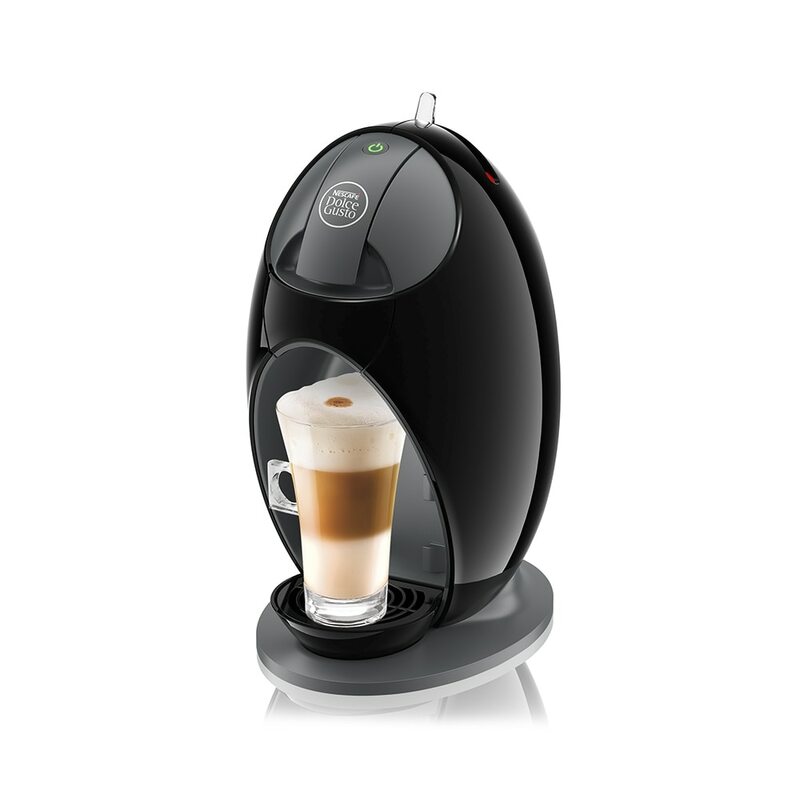 Stir occasionally until smooth and creamy. Transfer the porridge into a bowl & decorate with banana slices, goji berries, pecans, desiccated coconut and a drizzle of honey. Drizzle with melted chocolate and sprinkle chopped hazelnuts. 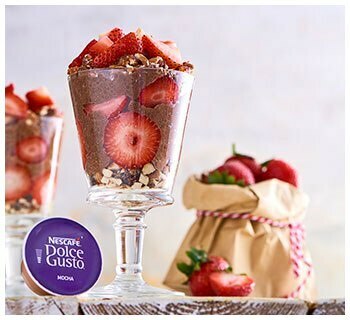 STRAWBERRY MOCHA CHIA PUDDING JARS Make a quick-to-prepare cup of luscious, creamy, caffeinated pudding loaded with chia goodness. Combine the Mocha capsule, chia seeds and maple syrup in a bowl. Mix well. In the morning, stir the chia pudding until smooth and creamy. Roughly chop the dates and almonds. 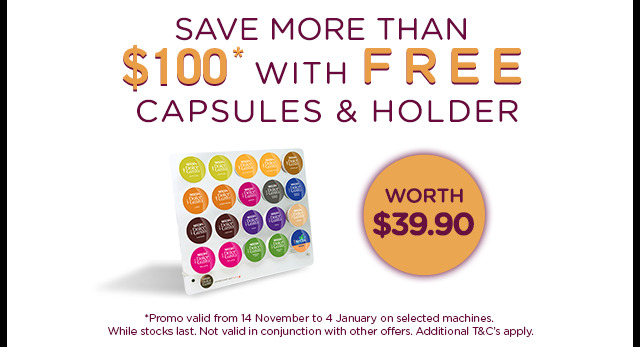 Fill the bottom of the jar. Add mocha chia pudding on top and decorate with fresh strawberries. 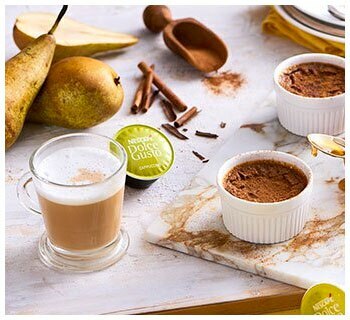 PEAR & CAPPUCCINO CUSTARD POTS Taste the goodness of velvety smoothness and rich aroma in a custard pot. Arrange diced pear at the bottom of 6 small ramekins. Sprinkle with ground cinnamon. 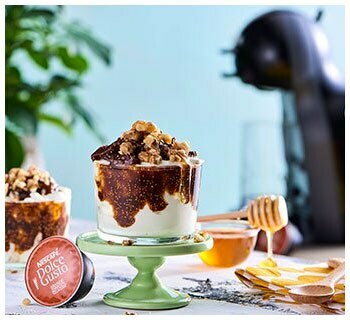 Blend Cappuccino capsule with corn flour. Add remaining ingredients and mix well. Put ramekins in a baking dish filled half way with boiling water and bake for 15 minutes. Let cool for 20 minutes and refrigerate.Serve cold with a drizzle of honey. 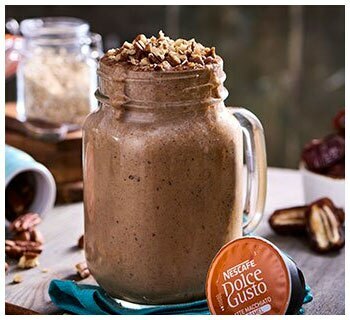 LATTE MACCHIATO PECAN CARAMEL COFFEE SMOOTHIE Start the day with a thick, flavourful smoothie, packed with oats, pecans, dates and a caffeine kick to bounce off the day! It tastes delicious and is perfect as a quick breakfast for those on-the-go. Add pecans and oats to a blender and pulse until they form a powder. Add remaining ingredients into the blender and process until smooth. Add 10 ice cubes, blend and serve immediately.